Free attractions line the Las Vegas Strip and they’re not hard to find. The Mirage’s volcano erupts in a lagoon filled with waterfalls and palm trees every 15 minutes from dusk to midnight. The Mirage joined forces with legendary Grateful Dead drummer Mickey Hart, Indian music sensation Zakir Hussein, and the Fountains of Bellagio design firm WET to create an audio/visual spectacle for its famous volcano attraction. WET forges a primal volcanic environment of sound, light, music and heat with choreographed FireShooters, which send massive fireballs more than 12 feet into the air. The volcano attraction features a state-of-the-art sound system with music and sound specially created by Hart and Hussein. Meanwhile, the world-famous Fountains at Bellagio thrill visitors with more than 1,000 water-emitting devices choreographed to music by artists such as Frank Sinatra, Elton John, Whitney Houston, Tiesto and Andrea Bocelli. 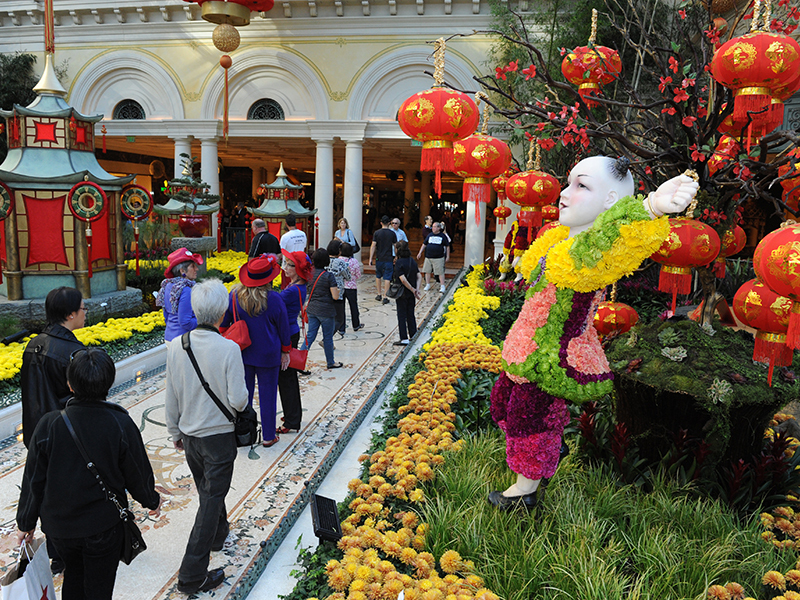 While at Bellagio, be sure to explore the Bellagio Conservatory and Botanical Gardens. The unique indoor garden changes throughout the seasons and is open to all guests to the property. Downtown's famous, casino-lined street is known as the Fremont Street Experience, a 175,700-square-foot pedestrian area covered by a continuous canopy studded with more than 14 million lights. Each evening on the hour, this canopy comes alive with spectacular light-and-sound shows. From Westgate to Luxor to JW Marriott, most major resorts offer free lounge entertainment that is available practically around the clock. Low-priced attractions abound as well. “The Mac King Comedy Magic Show” at Harrah’s Las Vegas is a great show value, with tickets priced at $32.95. The show contains quirky humor, visual gags and King’s sleight-of-hand, all delivered in a tongue-in-cheek fashion. For lunchtime bargain-hunters, nothing beats the classic shrimp cocktail at Dupar’s inside the Golden Gate Hotel & Casino, the oldest hotel in Las Vegas. For gourmet on a budget, many Las Vegas buffets now offer fare from around the world and at a reasonable price. Purchase the “Take 2 Buffet Pass” and enjoy both the Excalibur and Luxor Buffets all day for only $35.99 per guest weekdays or $39.99 on weekends. Offering a savings of more than $20 off regular pricing, the value package includes VIP buffet line passes and unlimited reentry privileges. Caesars Entertainment’s family of Las Vegas resorts now offers guests all-day, unlimited access to dine in five resort buffet restaurants with the Buffet of Buffets pass. Guests may purchase a 24-hour buffet pass ($49.99 for Total Rewards members) from any participating buffet’s cashier stations and can use it at Paradise Garden Buffet at Flamingo, Flavors at Harrah’s Las Vegas, Le Village Buffet at Paris Las Vegas, Spice Market Buffet at Planet Hollywood Resort & Casino and Carnival World Buffet at Rio All-Suite Hotel & Casino. For an additional fee, guests can upgrade the Buffet of Buffets pass to include the Bacchanal Buffet at Caesars Palace. 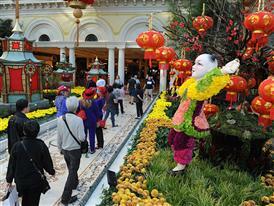 A group of Las Vegas-based tourist attractions have banded together to form Best Vegas Attractions. BVA’s objective is to provide value-added opportunities for travelers and visitors through special offers and values. The program is designed to save visitors up to $500 or anywhere from 15 to 50 percent off the regular prices. Participating attractions include the Las Vegas Monorail; Madame Tussauds Las Vegas; Papillion Airways; and more. Looking for discounts at the mall? Go to www. LasVegas.com. Under “Shopping,” users can download the Shop Las Vegas Passport coupon redeemable for gifts and discounts at most Las Vegas malls, including Fashion Show, Miracle Mile Shops at Planet Hollywood and Las Vegas Premium Outlets to name a few. While you’re at the malls, check out the variety of free entertainment they offer such as the street performers inside the Grand Canal Shoppes at The Venetian. Get the ultimate souvenir with a photo of yourself at the iconic “Welcome to Las Vegas” sign on Las Vegas Blvd. The sign was added to the National register of Historic Places and is easily accessible to visitors by foot or automobile. If sparkle is more your style, the Swarovski Midnight Celebration at Grand Bazaar Shops is a dazzling 3-minute-long light-and-sound show. The spectacle was envisioned as a way to bring New Year’s Eve-style excitement to the Strip every night of the year. The production incorporates both the Starburst and a large video screen embedded into the multi-faceted façade of the Swarovski boutique. Evocative scenes from exotic bazaars, as well as the Starburst’s more than 1,800 points of LED light, will be choreographed to a dramatic original score featuring the enchanting beats of world music. The one-of-a-kind Swarovski Crystal Starburst is 14-foot-diameter structure and composed of 924 custom-cut Swarovski crystal spheres.